The names on the board are no longer very easy to read but we have followed the same order below. Because of the nature of their work, comparatively little information is known about each man. We shall add more information as and when we acquire it. 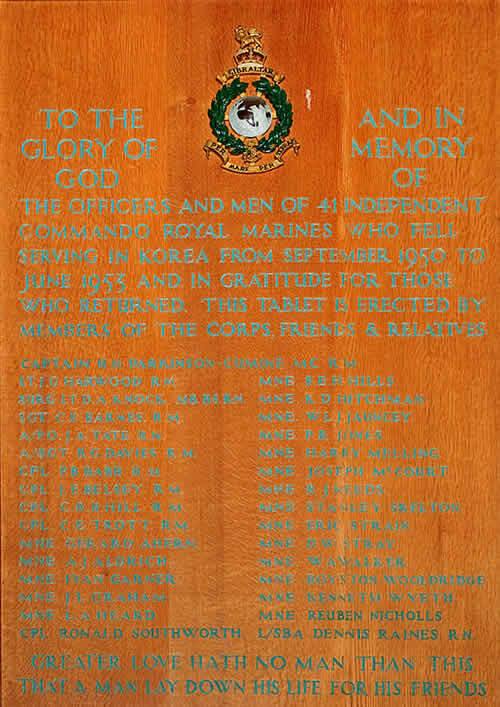 The officers and men of 41 Independent Commando Royal Marines who fell, serving in Korea, from September 1950 to June 1953 and in gratitude for those who returned this tablet is erected by members of the Corps, friends and relatives. Captain Ralph Parkinson -Cumine RM. Missing, presumed killed. 29 November 1950. This was the day of the Battle of Hagaru-Ri and Chosin Reservoir. Lieutenant John G. Harwood of the Royal Marines. Ambushed and killed alongside Sergeant Charles Barnes (see below) 30 August 1951. Surgeon - Lieutenant Douglas Alexander Knock, RN. DOW 29 November 1950 aged 27. Buried in the UN Memorial Cemetery. RM 4003 Sergeant Charles E. Barnes. Killed in action 30 August 1951. C/JX 166456 Acting Petty Officer John A Tate. Killed 29 November 1950 - age not known. RM 5115 Acting Sergeant Ronald G Davies. Accidentally killed by ROK soldiers at Haguro-Ri on 29 November 1950. PO/X 5096 Corporal Ronald B. Babb. Husband of Marie who lived at Caradon View, Minions, Nr. Liskeard. KIlled in action 7 October 1950. PLY/x 5281 Corporal Charles Edwin Trott. Died 29 November 1950 aged 21. Buried in the UN Memorial Cemetery. RM 9440 Marine Gerald Ahern.Missing in action - became a POW. Died aged 19 in captivity 30 April 1951. RM 9440 Marine Arthur James Aldrich. Captured near Wonsan in August 1951.Died 10 October 1951 aged 21, in Pak's Palace POW Camp. RM 9211 Marine Ivan Garner. Died 29 November 1950 aged 19. Buried in a mass grave at Koto-Ri. RM 9087 Marine John L, Graham. Took part in the battle at Chosin reservoir. Died of wounds 29 November 1950 aged 18. RM 9162 Marine Lewis Anthony Heard. Died of dysentery while a POW at Camp 10 Kaggye. Died 6 January 1951 aged 21. RM 10038 Corporal Ronald Southworth. Missing in action at Chosin. Died 29 November 1950 aged 22. Presumed killed in action. No known grave. RM 9162 marine Stanley Edward Herbert Hills, born 20 March 1915 in London. Died 6 January 1951 aged 35. No known grave. RM7796 Marine Keith David Hitchman. Killed 16 October 1950 aged 19.in a road accident in Japan. Born in Cheltenham 10 July 1931. CH/X 4020 Marine William Leonard James Jauncey. Killed 29 November 1950 aged 26. Buried in a mass grave in Koto-Ri, Came from Bellbroughton, nr. Stourbridge. RM 8682 Peter Raymond Jones, son of Mrs Jones of Penarth, S. Wales. Killed in action during a coastal raid off North Korea 2 october 1950 aged 18. Buried at sea from USS Perch. CH/X 3594 Marine Harry Mellings, born 31 October 1931 Liverpool. Died as a POW 7 April 1951 aged 28. No known grave. RM 9046 Joseph McCourt, born 13 August 1930 in Hamilton, Lanrkshire. Missing, presumed killed 29 November 1950 aged 20. RM 9257 Marine Robert James needs, born in Bristol 16 February 1932. Died as a POW 30 January 1951 aged 19. RM 8648 Marine Stanley Skelton, born in Scarborough 20 November 1931. Died 11 April 1951 aged 19 as a POW. No known grave.. He was the youngest man in this contingent. He joined the RM in January 1949 but was still only 18 when they left for Japan. PO/X 5315 Marine Eric Strain, born in Southsea 19 August 1924. Killed 29 November 1950 aged 26. RM 9245 Marine Dennis Wilfred Stray, born 10 August 1927 in Portsmouth. Died of wounds received in action at Chosin reservoir 29 November 1950 aged 23. RM. 8800 Marine William Arthur Walker, born 18 July 1928. Killed at Chosin 29 November 1950 aged 19. RM 9401 Royston Wooldridge, born 8 December 1931, Stourbridge, Worcs. Killed 29 November 1950 aged 19. RM 8784 Marine Kenneth Wyeth, born 24 December 1931, Plumstead, London. Died 30 May 1951 as a POW. No known grave. PO/X 6067 Marine Reuben Nicholls, born Colville, Leics 5 June 1925. He was the only Royal Marine among a group of US POWs who were told in April 1951, they would be handed over to the UN Command and the only one who was never heard of again. He is presumed to have died 31 May 1951 but this cannot be confirmed. One of the few naval personnel on this mssion - he volunteered to accompany Surgeon Lieutenant Knock. He was D/SMX 853707 Leading Sickbay attendant Dennis Raine at HMS Drake in Plymouth, born in Lancashire 14 January 1923. Taken prisoner at Chosin but killed attempting to escape 2 December 1950 aged 20. Able Seaman Charles R. Creech RN (no number given on any document), born in West Ham in 1929. Thought to have been killed on 29 November 1950 but may have been taken prisoner. His name does not appear on any UN lists. No name or number available for Sick Berth Petty Officer J. P. Lloyd nor does his name appear on any document. Killed 29 November 1950. His name brings the number of Royal Navy participants in this mission to 4.